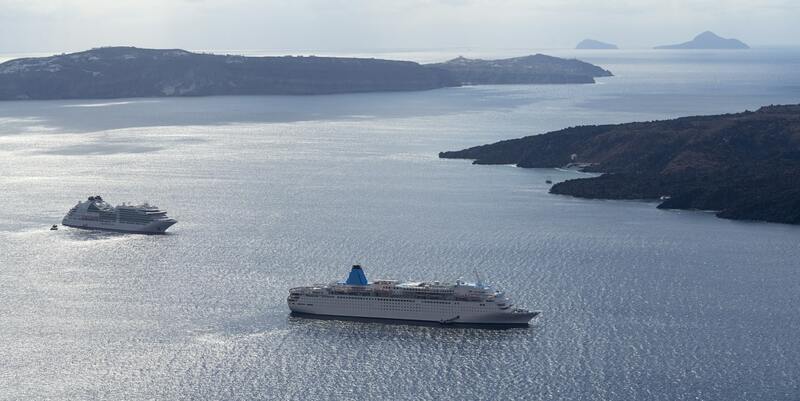 Ferries from Athens to Santorini depart both from the port of Piraeus and the port of Rafina. While Rafina is mostly used for smaller catamarans, Piraeus ports allows for more options, including large conventional ferries that offer a smoother ride. The journey duration varies from 5 to 8 hours, while ticket prices start from as low as 20 euro (special offer tickets) and reach up to 115 euro for a cabin berth. The standard seat ticket on high speed catamarans costs approximately 68 euro, and business class seats cost approximately 90 euro. The journey time from Athens to Santorini (from Piraeus) varies between 5 and 8 hours, depending on the ferry type. The fastest options are high speed boats of Seajets and Golden Star Ferries that perform this crossing on approximately 5 hours, while conventional vessels of Blue Star Ferries perform the crossing in about 8 hours. Although the latter might sound a lot, in reality the beatuful scenery makes this trip a remarkable experience, especially for those performing it for the first time. What type of ferry to choose from Athens to Santorini? This decision depends on what type of traveler you are. If you want to arrive at your destination as soon as possible, and the ferry is just a means of transportation to you, probably a high speed catamaran (Seajets or Golden Star ferries) is the best choice. If, however you want a smooth ride, with the option of walking around open decks and enjoying the scenery, you should book on a Blue Star Ferries vessel. The trip duration is rather long, but it is surely worthy. Between Athens and Santorini, the ferry will be performing 20-30 minute stops in Paros, Naxos and Ios and you will have the chance to get some nice photos of these beautiful islands. What time do the ferries depart to Santorini? The earliest ferries depart from the port of Piraeus by 07.00 in the morning, while the latest departs at 17:30 in the afternoon on a daily basis, and as late as 21.30 some weekdays. There is no overnight ferry from Athens to Santorini operating on a regular basis. During high season however, some operators perform late-night itineraries with conventional ferries that depart from the port of Piraeus at around midnight, and arrive at Santorini early in the morning. The cheapest way to get from Athens to Santorini is with Blue Star Ferries (conventional vessels). If you book early enough, you might be able to book special offer tickets that cost only 20 euro per person (for a deck ticket). Overnight ferries from Athens to Santorini are quite infrequent. Tickets to Santorini always sell out fast during high-season. If you are planning to take a ferry from Athens to Santorini on late July or August, make sure to book your tickets well in advance. If you are traveling on an open-deck ferry, don't miss your chance to enjoy the scenery. Your ferry will make stops in Paros, Naxos & Ios, and the view of these islands from the deck is magnificent. Ferry rides can become a bit bumpy during summer. There is absolutely nothing to be worry about, rather than getting a bit seasick. Here are some trick you can use to avoid seasickness. Island hopping around Santorini is the best! Check our Ferry Maps to discover the islands nearby.